9/3 Cup of Coffee: Three affiliates ended their seasons on top on Sunday, while the chances for postseason play for a fourth took a hit. In tuneups for their upcoming playoff series, Pawtucket and Salem came out victorious. Greenville came out on top of its season finale as well. Lowell took a loss, and missed its chance to move into a tie in the wild care race. Pawtucket cruised in its final regular-season contest with a 4-0 win over the Lehigh Valley IronPigs (PHI). It was a true team effort, as five pitchers combined for the shutout, while the offense churned out 11 hits. Charlie Haeger got the start and allowed just one hit in his four innings, and Alex Wilson was credited with the win for his scoreless frame. Dan Butler was 2 for 4 with a double to lead the offense. Christian Vazquez made his Triple-A debut, going 0 for 3 with a walk. The PawSox travel to Frontier Field on Wednesday to being a best-of-five series with the Rochester Red Wings (MIN). It was an anti-climactic end to the Portland season. It's game against the Trenton Thunder (NYY) was canceled by rain. Like its Triple-A counterpart, Salem was victorious in a playoff tuneup, downing the Lynchburg Hillcats (ATL), 4-3. William Cuevas was sharp in earning the victory, allowing a run on four hits in six innings. Cuevas struck out three without issuing a walk. Mookie Betts continues his assualt on Carolina League pitching. The second baseman drove in all four Salem runs, ripping a pair of doubles in a 2-for-4 effort. Stefan Welch and Henry Ramos added a double apiece. Salem hosts game one of its best-of-three series against the Myrtle Beach Pelicans (TEX) on Wednesday. It was a difficult season for Greenville, but the Drive were able to end on a high note with a 1-0 win against the Savannah Sand Gnats (NYM). Sergio Gomez (pictured) was outstanding to pick up his first South Atlantic League win, giving up three hits in six scoreless frames and adding six strikeouts. Austin Maddox added a perfect seventh, and Kyle Martin struck out four and walked one in his two hitless innings. Lowell got some reinforcements earlier in the day, but fell 7-3 to the Aberdeen IronBirds (BAL). Daniel McGrath was let down by a pair of errors behind him as well as with his control. The left-hander walked five while allowing two hits and allowing four runs (one earned) in 1 1/3 innings. Aaron King led the offense, going 2 for 4 with a triple, two runs scored, and an RBI. The rest of the Spinners offense combined for only one hit. Player of the Day: Greenville finished 36 games under .500 and far out of playoff contention, but still had some strong individual performances. One of those was by Sergio Gomez, who finished his season with two straight outings of six shutout innings. 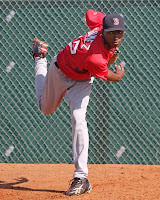 After his early-August promotion from Lowell, Gomez had a stellar 2.31 ERA and 1.029 WHIP, striking out 20 in 23 1/3 innings. In all, Gomez finished with a 2.08 ERA and 80 strikeouts in 78 innings across two levels.